This is in the Hocking Hills region of Ohio. 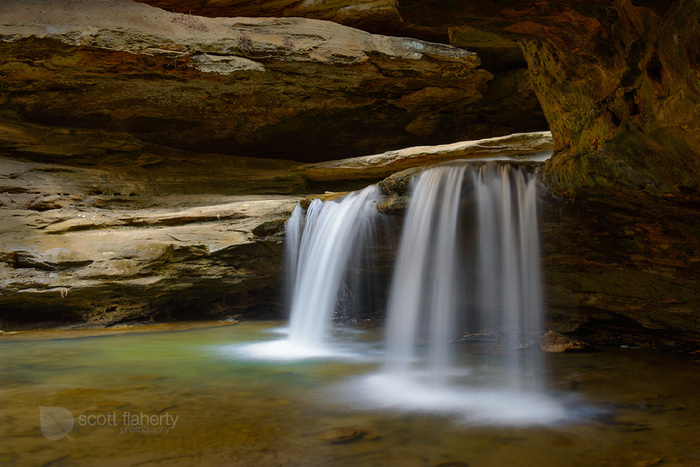 There is a guy on insagram that lives bybthis location i believe his account is @myhockinghills i want to get to this place sooo bad lots of beautiful shots to be had like this one.i like this shot you got the lon exposure and retained the details in the shadow areas well done . Beautiful location and excellent capture Scott. I would still do a little selective vignette, so that the subject could come more to the point, and that some brighter parts (upper left) would not distract attention. Thanks for the suggestion. I'll give that a try and see how it looks. 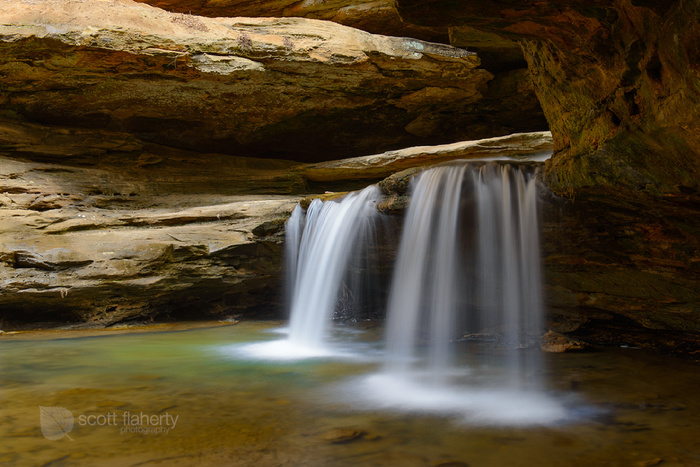 I think this is well composed with good shadow detail and highlights/whites that draw the eye in.I like the exposure length also - long enough to smooth details but not so long as to lose detail in the streams of water. As with Radisa I do think you could try to reduce the exposure on the upper rock structure (by vignette or painting) so that it does not pull the eye from the subject. Otherwise i wouldn't change a thing. Great shot Scott, seems very serene. As mentioned above by Radisa and Alan, maybe some post creative vignette, along with some subtle light painting, and maybe even enhance certain under shadows just a tad (don't lose detail). Here's a quick edit, I left most of the light at the top and added some light to the water and just opened up the shadows a tad behind the water and slightly deepened the shadows under the rocks on the right. For me, I like seeing the light come from somewhere (above) and have it moving through the piece. These little tweaks I did kind of start to push the composition in that direction. Really like this one, nice. I did it quick just to show example so water isn't buttery smooth, sorry for the slop job. Watermark immediately kills my eye, but, that has nothing to do with the photo itself - which is awesome. Beautiful, beautiful exposure. What a cool place too! Really like the color of that pool, and you got some great detail here to compliment that silky smooth exposure. Awesome shot! It's a cool spot! Been there a few times. There's always a ton of people, so great job capturing this with no one in the shot. I always have kids running in my photos.